When we were selected as the winner of the Vernier Engineering Contest in 2015, it really took our use of data-collection technology to the next level, and it kick started our engineering instruction at Beebe Junior High in Beebe, Arkansas. In my classroom, it’s all about hands-on learning and data collection. While my 7th and 8th grade students used to think it was just fun or cool to see things explode or fly, their analysis of the data we collect using Vernier technology has helped them see the reason why we do the experiments. Today, we have more than 175 students involved in our engineering program. 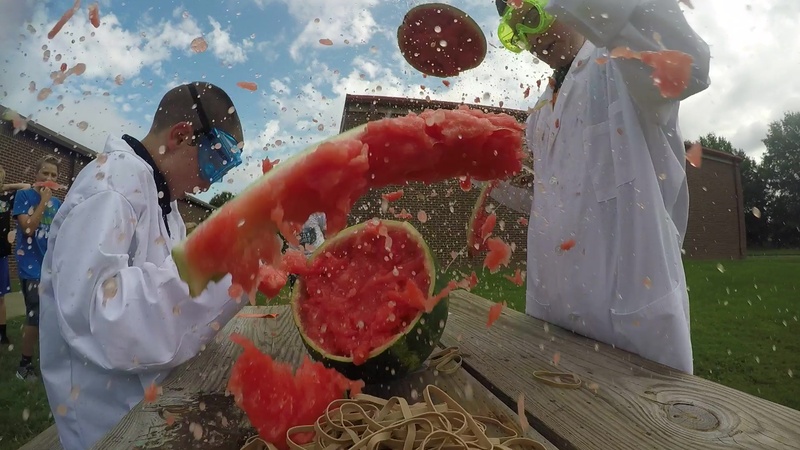 Students measure the acceleration of part of an exploding watermelon using Go Direct® Acceleration. My 8th grade students used a Vernier temperature probe with LEGO® MINDSTORMS® Education EV3 to find out the perfect time to bite into a popular snack. They were able to effectively use technology to present a solution to an everyday problem in order to make connections with the engineering practices identified in the Next Generation Science Standards (NGSS). This contest, which our school won again in 2017 and 2018, has helped us extensively grow our collection of data-collection technology. Students now have access to a large collection of Go Direct® sensors, LabQuest® 2 interfaces, and LabQuest sensors, such as UVA, radiation, and motion detectors. Now when we conduct experiments like a high altitude balloon launch, we can collect environmental data. It’s one thing to be able to capture pictures, but it’s a whole other thing to get information on parameters like wind patterns and altitude. Data collection makes this whole project much more meaningful and educational for students. It puts things in perspective and really helps them grasp the various concepts they are learning. Some of the Vernier technology used in Beebe Junior High School’s Engineering Program. Outside of engineering, students in flight and space, computer science, design and modeling, automation, and robotics classes benefit greatly from using Vernier data-collection technology. In today’s tech-driven world, all of our students are excited to use various technologies during class. And, as teachers, we are excited to continue to support them in this type of hands-on learning.